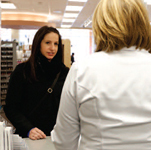 The Nova Scotia Drug Information System is a province-wide system that will, over time, contain a comprehensive medication profile for everyone who gets a prescription filled in a community pharmacy in Nova Scotia. Your medication profile includes information about the prescriptions you have had filled as well as important medication-related information such as allergies, adverse reactions and medical conditions. The Drug Information System allows authorized health care providers to access your medication profile and to contribute medication-related information to it. Having access to your medication profile when and where it is needed will help your healthcare providers make better decisions about your care. An authorized healthcare provider is someone who provides or supports healthcare services in hospital or in your community, such as a physician, dentist, nurse practitioner, registered nurse, pharmacist , optometrist, dental hygienist or midwife. The Drug Information System is a part of Nova Scotia’s electronic health record (EHR) system called SHARE (Secure Health Access Record). It is a secure and private system - only authorized healthcare providers can access your medication profile and their access is subject to the provisions set out in the province’s Personal Health Information Act (PHIA). The Drug Information System will increase the quality and safety of patient care for all Nova Scotians and those who receive care here. Read about how the Drug Information System will improve safety and provide a better quality of care. Drug Information System is a component of Nova Scotia’s Electronic Health Record which allows authorized healthcare providers to access your medication profile when needed.